A black and white photograph of Richard Parkes Matthews. Richard Parkes Matthews (1919-1997) was born in Regina, Saskatchewan on March 30, 1919 and graduated with Honours from the University of Saskatchewan with degrees in Arts and Engineering in 1940. From 1946 to 1954 he was employed by RCA Victor and Federal Electric Companies. In 1946/47 he was project engineer for construction of two CBC broadcast transmitters and from 1949-53 was Chief Factory Engineer for a 46-channel telephone microwave radio link between St. John, New Brunswick and Halifax, Nova Scotia. 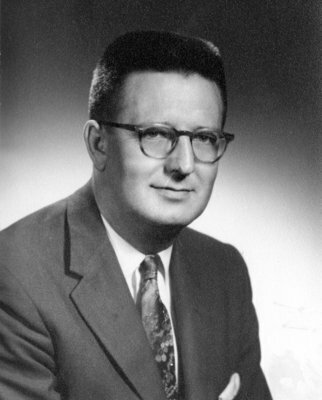 In 1954 he came to Whitby as Director of Sales and Engineering for the Canadian operations of Andrew Antenna Corporation and became Manager and Secretary-Treasurer of the Beech Street plant in 1958. He retired in 1984. In 1972 he was one of the first Canadian businessmen to visit China to open trade in the communication industry. Mr. Matthews was Vice-President of Andrew International and Managing Director of European operations in Edinburgh, Scotland, where he lived for a few years. He was a member of the Whitby Public School Board from 1958 to 1963 and chairman in 1961/62. He was also a member of the Board of Governors of the Whitby General Hospital and President of the Whitby Rotary Club in 1964/65. He was an Elder of St. Andrew's Presbyterian Church, Whitby. Mr. Matthews died in Whitby on July 19, 1997. Richard Parkes Matthews, 1959, Photographer Unknown. Whitby Archives 31-009-621.